4. LV-EMFS Survey Instrument Diagram A.c. magnetic field signals originating at the "reference sensor" are transmitted via UHF-FM link to a receiver within the Probe Instrument. These signals, along with signals from "MAG-03" tri-axial flux gate magnetometer, are processed through the intervening network and are sent via umbilical cable to a PCMCIA analog-to-digital converter card at the 486DX2-40 portable computer. Block diagrams of remote Field Reference Monitor and Probe Instrument. Survey data collection across single-circuit 115 KV transmission line right-of way. Survey data collection through 115 KV switchyard. 6. 115 KV Right-of-Way Data Record Signal of high spectral purity (low harmonic content) proportional to the transmission line currents are evident in the y, z and R channels. Magnitude of the x channel magnetic field signal is very low due to left-right source symmetry. 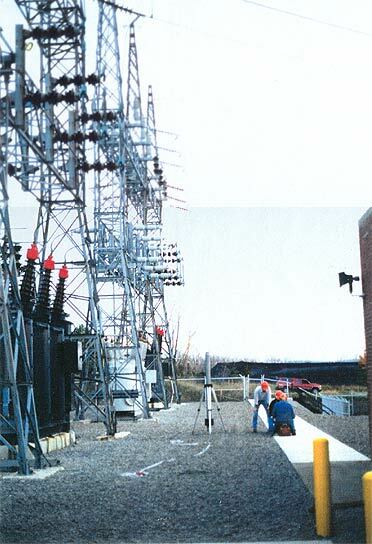 Time-resolved 115 KV transmission line right-of-way x, y, z point record [file 43]. 7. Fourier-Transformed Data Record Spectral analysis is employed by the survey instrument's computer program to extract the value of a fundamental line frequency in the range of 25 to 400 Hz. This capability provides an automatic means of identifying the basic source frequency for calculations such as relative phase. 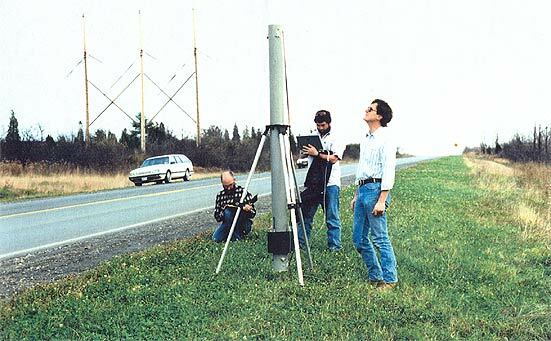 Frequency-domain transform of 115 KV transmission line right-of-way x, y, z point record [File 43].